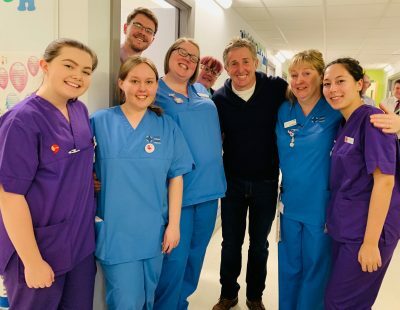 Welsh Rugby legend, Jonathan Davies OBE, has been visiting Noah’s Ark with members of the rugby charity, Wooden Spoon, this week. They were here to see the play and sensory rooms which were funded by Wooden Spoon following a donation of £250,000 to the Noah’s Ark Charity. Jonathan kick started the project in 2006 when he ran the Great North Run in Wooden Spoon colours. While Jonathan was here he met with Lilly-May, a four-year-old patient on Island Ward. Lilly-May has a brain disease called leukodystrophy and has been a patient at the children’s hospital since Christmas. 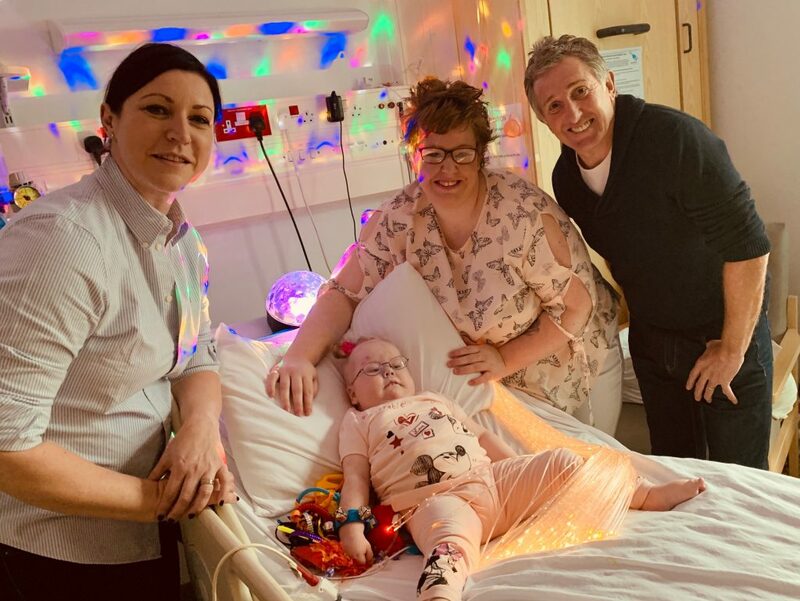 Mum, Rhian, says they’re not expecting to be discharged for a while yet and that the sensory room and equipment have been of huge benefit to her daughter during their stay. Wooden Spoon, the children’s charity of rugby, funds projects for disadvantaged children throughout Wales and the UK. It chose to focus its support of the children’s hospital on play and sensory rooms because of the direct impact they have on children’s wellbeing. Wooden Spoon has a long standing link with Noah’s Ark, having become involved with the charity during its initial appeal to raise money for the hospital’s first phase, which opened in 2005. The Noah’s Ark Charity have since raised over £22 million to build and equip Wales’ only children’s hospital and continues to provide support by funding life-saving equipment, facilities and services for families.